Johnny B. Rotten, a writer who makes his living making fun of the people who make the world an interesting place to live, has officially been banned from covering the 2012 Olympics in London. Rotten is accused of illegal use of steroids while penning some articles leading up to the games. Writer who does his best work while out of his mind on steroids gets banned from covering the Olympics. “He is completely out of his mind when he’s on steroids,” claims one writer who, before now, had nothing but the utmost respect for one of the best satirists in America. 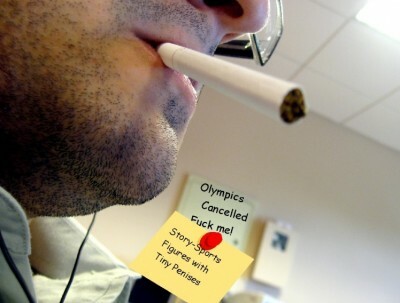 Bringing back the entire Michael Phelps bong controversy, a story which Rotten believes isn’t all that ironic anyway considering how many other satirists have done the same thing while not even under the influence of steroids. This isn’t Rotten’s first run in with covering sporting events and being denied a press pass due to steroids. “I’m the one who put the bug in Roseanne’s ear to spit and scratch herself at the end of singing the National Anthem back in the 90’s. What a great bit of satire that was,” said Rotten, chuckling. “Actually, still makes me laugh when I see it, but again, those sports people just aren’t endowed with much of a sense of humor.” [Note to self—do story on poorly endowed sports figures]. Rotten has filed an appeal with the Olympic Board, but is doubtful a decision will be handed down before the end of the Olympics. In the meantime, he says he’ll go back to LA and write crap for Celebitchy and Perez Hilton’s Blog.